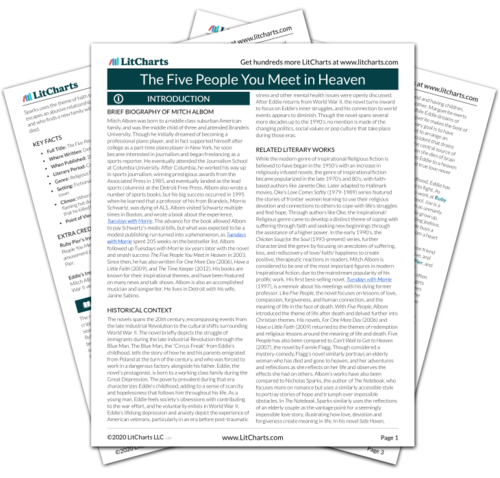 Instant downloads of all 945 LitChart PDFs (including The Five People You Meet in Heaven). 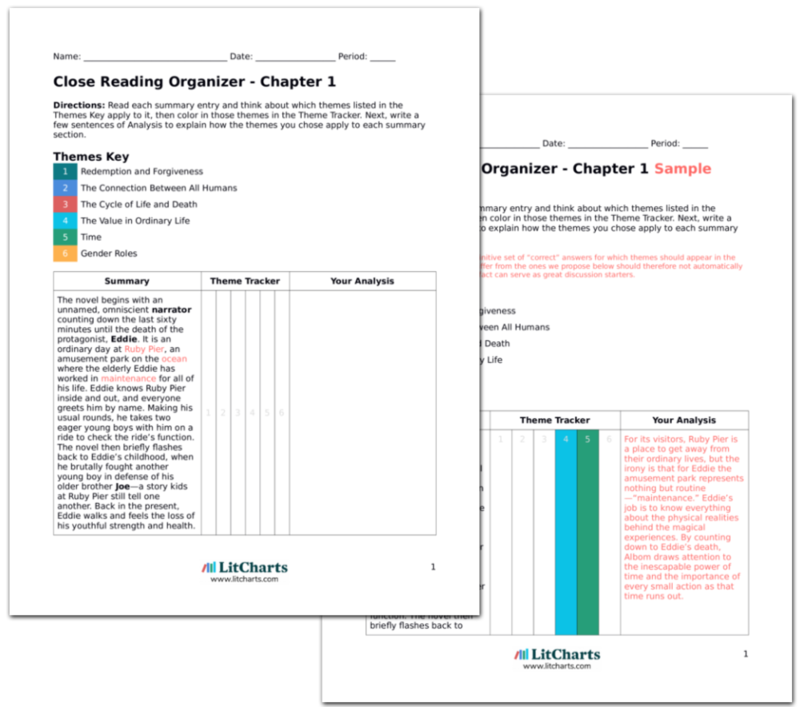 LitCharts assigns a color and icon to each theme in The Five People You Meet in Heaven, which you can use to track the themes throughout the work. Alone again, Eddie finds himself in a room with a row of doors. He realizes he is starting to feel old, and that he is aging as he passes through each stage of heaven. Suddenly, he finds himself at a wedding in another time, where everyone is speaking German or Swedish, and where he knows nobody. He walks out, and finds himself at a Spanish wedding, and then at an African wedding, and then several others of different eras and cultures. He remembers how much he disliked weddings in his life, because the dancing and festivities always reminded him of his bad leg. Eddie then finds himself at an Italian wedding, where a beautiful bridesmaid is passing out candied almonds, saying, “For the bitter and the sweet.” As she approaches, Eddie recognizes her as a young Marguerite, and he falls to his knees. Even though Eddie loved Marguerite, he hated weddings because they reminded him all of the things he lost in the war. While he focuses on his inability to dance, the loss of his leg’s mobility also represents everything else he lost in the war—his sense of joy, his ability to celebrate, and his ability to fully experience love untouched by loss or darkness. The heaven of weddings around the world connects Eddie and Marguerite’s love to the universal experience of love. But everything isn’t perfect—as Marguerite’s candied almonds symbolize, love is both bitter and sweet. Ballinger-Dix, Elizabeth. "The Five People You Meet in Heaven Chapter 26." LitCharts. LitCharts LLC, 8 Jan 2016. Web. 23 Apr 2019. Ballinger-Dix, Elizabeth. "The Five People You Meet in Heaven Chapter 26." LitCharts LLC, January 8, 2016. Retrieved April 23, 2019. https://www.litcharts.com/lit/the-five-people-you-meet-in-heaven/chapter-26.